In large microwavable bowl, mix butter, brown sugar and bananas. Microwave uncovered on High 1 minute 40 seconds to 2 minutes or until bananas are cooked and caramelized. Add cake mix, sour cream, vegetable oil and eggs. Beat with electric mixer on low speed 1 minute. Increase speed to medium; beat 2 minutes. Stir in walnuts. Pour into pan. Drizzle cake with caramel topping. Sprinkle with kosher salt. Can't find spice cake mix? Substitute yellow cake mix and 1 teaspoon pumpkin pie spice instead. To toast walnuts, sprinkle in ungreased heavy skillet. Cook over medium heat 5 to 7 minutes, stirring frequently until walnuts begin to brown, then stirring constantly until walnuts are light brown. 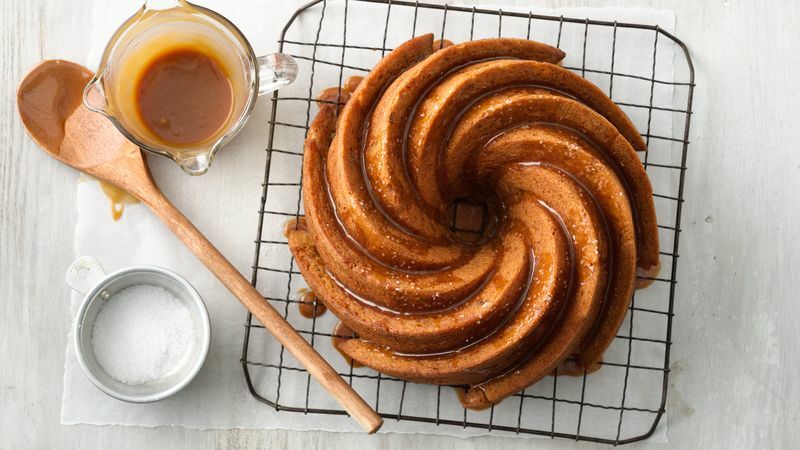 This cake was photographed using a heritage bundt pan. Deeper pans like the heritage pan may require an additional 2 to 7 minutes of bake time.